I read in the Star newspaper that Tun Dr. Mahathir is trying to be nominated for the Nobel Peace Prize see Star newspaper Mahathir nominated for the Noble Prize by Dr Ejup Ganic, who was Vice-President of Bosnia-Herzegovina from 1990-96 and President of the Federation of Bosnia-Herzegovina until March 2001. Bosnia-Herzegovina is a Muslim country, right? I was shocked at the news. What did Dr.Mahathir do? What major economic or peace policy did he implement? It is the Prime Minister's job to look after his own country, isn't? Dr. Mahathir did not do anything of this nature during his lifetime as the Prime Minister of Malaysia. He never was involved in the abolition or reduction of armies as the ASEAN philosophy was that of noninterference and non-alignment. ASEAN nations never took sides with any super powers. What did he do last year for the fraternity of nations? Did he help reduce tensions between the Israelis and Palestinians? No. Did he bring the Super Powers towards a more amicable relationship? No. Putin is still occupying Crimea. Did he influence the Muslim terrorists around the world to lay down their guns? No. Did he help the Syrian people when they were being bombed? No. Did he stop China from occupying the Spratly islands or the Paracel Islands or other islands in the South China Sea? No. What did he do last year? Let me tell you about my experiences with this man. During the 1997 Crisis I wrote many letters (see my letters) to, then Datuk Seri Dr.Mahathir, to guide the country out of the recession due to the 1997 Asian Financial crisis. In letter4 I calculated the Ringgit should stabilise at RM3.80 = USD$1.00 and that is why the Ringgit was set to this value. This was possible because I had spent 6 years, from 1992 to 1998, developing the Mathematical Theory of Markets for which I was awarded a Doctorate in Economics by an American University in 2009. When the 1997 Asian Financial Crisis began Dr. Mahathir thought that Malaysia's economy would be annihilated and we would enter into a major Depression. Thousands of businesses, mostly Malaysian Chinese, they control the Malaysian economy, would have closed, resulting in no tax revenue for the government. There were many rumours about Dr. Mahathir. Many were saying that, when the stock market was crashing, that he would been in so much debt that his debts could not be paid back within 7 generations. So you can see how bad the situation was back then. All the politicians were in a panic and Dr. Mahathir was in Japan when he complained to the whole world that no one predicted the economic collapse of 1997. It was at that point that I began to write to him and told him that I had predicted the 1997 stock crash. After that I explained that I had gone to many institutions and had applied for government research grants and funds form private institutions to help me carry out this research into predicting stock and commodity market movements. Everyone I met turned me down as either they thought it was impossible or because I was a non-Muslim (non-Bumiputera). Dr.Mahathir had made sure almost all government grants were given to Muslim organizations only. It got to the point where he was even funding foreign Muslim organizations (Iranian) but would not grant or lend a cent to small non-Muslim entrepreneurs. I wrote to him about this. It was due to my research work on mathematical models in economics that I had an understanding of how economies oscillate. As a result I could explain to the Malaysian government in 1997 and the American government in 2009 how to reduce the impact of the crash and prevent the economy going into a tail spin and depression and how to recover from such an economic calamity. Was Dr. Mahathir pro Islam? Actually if you think about it, he made Malaysia a pro-Muslim apartheid country where almost all scholarships and grants and loans are given to Muslims only. Muslims were provide lower loan interest rates and lower house prices. We, the rest of the hard working non-Muslim Malaysians, had to fend for ourselves on our own. What is this "Prosper Thy Neighbour" policy? Was it ever implemented anywhere? Don't believe the government statistics. They will report that many non-Muslims were awarded this and awarded that but they never tell you that the money was never paid or never paid in time. This is Dr. Mahathir policy in Malaysia. In Malaysia they are claiming that Dr. Mahathir is like the great Nelson Mandela. Was he like Nelson Mandela who spent 27 years in prison and pushed for, according to Wikipedia "dismantling the legacy of apartheid by tackling institutionalised racism and fostering racial reconciliation"? No. Dr. Mahathir was putting people in prison under the ISA. What a great shame has come over this country. During that period of the 1997 Asian Financial Crisis, the politicians were so panicky that they analyzed my letters to the PM (Dr. Mahathir) in detail. They followed everything I said. There was even a point when my parent's house phone was bugged so that they could monitor all phone conversations. That was in vain as I rarely used my parent's phone. By the way, my letters were widely photocopied and circulated until even the US Embassy knew about me and my work. At one point, while I was selling toys on the streets of Bukit Bintang, Kuala Lumpur, to fund my research, the street police came to shake my hands because of the help I was giving to the country. Did you know that it has been 20 years since the crisis and not one person, except for those policemen, thanked me for the help I gave? Looking back, I realized that they were hoping that I would become very poor and would have to beg the pro-Muslim government for grant or funds. They thought that by doing this they could take control of this technology and put it under Muslim control. Derived the mathematical equations that describe all markets whether they are commodity, stock, forex, or the real economy will oscillate. The equation of markets is M(z) = W(z) + I(z) + N(z). This is the equation that made markets, stocks, commodites, ... etc predictable upto a few years into the future. coined the term the Real Economy in one of letters to Dr. Mahathir, which is now used in the West. Shown the relationship between probability theory and wave theory and that was when I realized that there is no such thing as duality of nature as debated in Physics. That is oscillatory functions can be converted to probability functions as the final value. Shown the difference between inflation and hyperinflation - they are completely different phenomena because hyperinflation is part of an oscillatory function. Hyperinflation is actually a Bull run on consumer prices. Derived a mathematical technique to identify the bestselling products in an organization. Invented group probability theory. Could be better named as crowd probability due to the popularity of social media. Showed that the standard Demand Supply curve is not correct in one of my writings to President Barack Obama when I was one of those who were guiding USA out of the Great Recession of 2008. Remember how the stocks and property prices tumbled and the lost jobs? Derived the relationship between Demand, Supply and Inflation, D - S = kI, in an article to President Obama. Developed the mathematical models that can predict how businesses will behave a few years into the future. We could look at their current monthly accounts and project their performance 2 or 3 years into the future. The accounts could look currently rosy but the business could crash in 2 or 3 years if nothing is done. Currently accountants just mark up this year's performance by 10% to predict the performance next year. Corrected the understanding of Risk and Exposure in an article to President Barack Obama. Wrong understanding of Risk and Exposure caused many banks to fail in the West especially during the Great Recession of 2008. Taking risks does not destroy anyone, it is their exposure to the risk that can be dangerous. Even explained that the leverages carried trading stocks, commodities & forex was too dangerous. Worst still the stock, commodity markets were not representative of real Demand and Supply as there were too many speculators acting as third parties not interested in taking delivery. Explained why there is a severe property price collapse during a recession in one of my articles to President Barack Obama. As a result most banks around the world have changed their auction procedures. This change was carried out in Malaysia too. Introduced the concept that money is like water and has flow properties in my letters to Dr.Mahathir and in my articles to President Barack Obama. Wherever money flows that is where prosperity will be. Isn't that the essences of Capitalism? Explained the Flash Crash mechanism. Predicted Brent Crude price collapse of 2014 back in 2012 when no one was expecting it. Today we know that Brent Crude Petroleum prices began to collapse in June 2014 and collapsed from US$110 to below US$30 per barrel and is now trying to recover from those low prices. 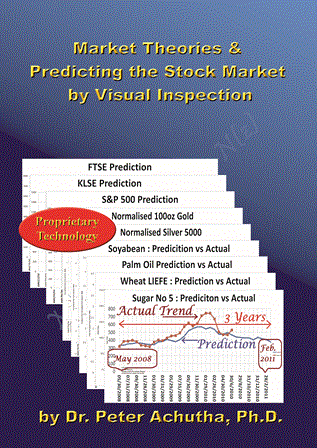 Freely published many commodity trend charts with predictions up to 1 to 3 years into the future so that many people could benefit. This theory can predict the shape of the trend, when the ups and downs occur but not the exact price. See my articles on Comparison of performance between NYSE, DJI, S&P 500 and NASDAQ since 2009, The S&P 500 trend until 2022, The Current NYSE Bull Run, Review of my commodity price trend predictions and many more articles on this blog. Many years ago I began to publish my theories on http://geocities.com/bachutha.com. After my Doctoral Thesis was published even software products like Metastock have changed their programs to allow users to try to predict trends a few months into the future. Before my work was recognised such programs did not have charts trends extrapolated into the future, only up to the current date. My work has spread around the world. These are completely new theories and mathematical models that can be used to revolutionize Economics but nobody in Malaysia has recognized my inventions. In fact the local universities did not want to know about my theories and models. My models are a completely different approach to Economics and are mathematical in nature, on par with Engineering or Physics, more like a Unified Theory of Economics. The powerful wanted to bury me. Why? Was it because Dr. Mahathir was desperate to be the first Malaysian to win the Noble prize? Finally, although I am a Computer Engineer, it was the Americans who awarded me the Doctorate in Economics. In fact no Malaysian university wanted me to submit my theories for a Doctorate. Don't you think that my work is a lot more impressive then Dr. Mahathir's work and should be nominated for the Nobel Prize instead of Dr.Mahathir? Why didn't anyone in Malaysian nominate my work? During those early years, I was looking at what could develop into some sort of unified theory of mathematics and mathematical models for Artificial Intelligence but after all the difficulties I have gone through I think I will work on them in my next life. Why was my research work and help during the 1997 Asian Financial Crisis hushed up in Malaysia? Worse still, back in 2000, I was blocked from applying for patents. The patent office took 7 years to respond to my patent application for a recycling process - one of my inventions. That is how grateful Dr. Mahathir was for helping him during the Asian Financial Crisis. He wanted to take control of all my inventions without paying a cent. They claim that Dr. Mahathir, he is a medical doctor, implemented the "Prosper Thy Neighbor" policy. Really? Have you seen any of our neighbors prosper because of Dr. Mahathir? He gave all the Muslims privileges and never cared about the non-Muslims. When the Malaysian Indian politicians, MIC, were robbing the Indians, in broad daylight, in Malaysia, Dr.Mahathir just kept quiet. What prosperity did he give the Malaysian Indians? Aren't they his neighbors that should have prospered? Why did he allow the Malaysian Indian politicians to rob the Indians? The Indians are one of the poorest communities in Malaysia but they are the worst treated people. Is this the standard for someone to be nominated for the Nobel Prize? I wish Angela Merkel was running this country and then you would see a prospering nation. The only "Prosper Thy Neighbour" neighbor he wanted to help was Indonesia as they are the largest Muslim nation in the world. Did he help Cambodia, Burma, Philippines, Vietnam, Laos or Thailand? Has any Malaysian heard of "Prosper Thy Neighbor" policy? What were the policy details? Should Dr. Mahathir be nominated for the Nobel Peace Prize? Do you remember how many people Dr. Mahathir imprisoned without trial? They detained many people under the ISA (Internal Security Act) for at least 2 years. I met one of them, a trade unionist, many years ago and he told me that the 2 years detention made him a little cuckoo. What? Dr. Mahathir for Nobel Prize? Do you know that in Malaysia it is very difficult to set up a Church? Dr. Mahathir's pro-Islam policies have done this. He even brought in Islamic law into Malaysia and set up Islamic courts. I think his intentions were to replace our modern civil law with Islamic law. There was a lot of opposition to this by the non-Muslims. Do you remember that he came up with the "Look East" policy so that we would not look to the Western countries for help, knowledge, ... etc? But he was sending hordes of Muslim students, by the thousands, on scholarships to study in Western universities! How many non-Muslims did he send on scholarships to study in the Western universities? Why did he want my theories? After almost 20 years I figured out why Dr. Mahathir was desperate to get hold of my theories in economics. Raja Petra Kamarudin wrote about this and I quoted him in my article on President Trump and the 7 Muslim nations. Raja Petra Kamarudin explained that back in the 1980's Bank Negara, our Central Bank, had been trading in forex to make money under Dr. Mahathir's rule. How can a Central Bank trade for profit on forex? They lost billions of dollars and that was the reason Dr. Mahathir wanted my research work. Could he not have paid for it? I am a non-Muslim so they wouldn't. My guess is that he wanted Islam to be the most powerful and richest religion in the world so that he and Islam could control the whole world. I believe that the FBI are investigating this. They stole my computer with all my research work in there and I lost some of my reserch work. The police refused to investigate. Honestly, I have been blacklisted by his people. When I apply to NGO's or similar organizations for help they never respond. They hush it up, there is no response and no help provided. There is at least one English newspaper that dislikes me and I suspect they are trying to blacklist me. Malaysian newspapers are owned by the political parties. Worst still I found out that I cannot sell my books without getting parliamentary or cabinet approval. It is getting scarier for me here. My worry is that since he has been reelected as Prime Minister there will come a day when I have to apply to a foreign country for asylum. I disagree with Dr. Angela Merkel on some of her policies but take a look at the human suffering in Syria. She gave refuge, safety and shelter to millions of Syrians and their children while their country was being bombed and devastated. The Syrians weren't her neighbors, they weren't Christians and they weren't German speaking and yet she invited them from almost 4000 km away to safety. What did Dr.Mahathir do? He is just going for the glory when others did all the work. Please nominate Dr. Angela Merkel for the Nobel Peace Prize.